﻿In order to request an official transcript please click on the button above to be taken to the Parchment website. You will need to create an account if you do not have one. Transcripts will be sent electronically to the requested school or employer. You may also request to have a transcript mailed to yourself. This service is free for all current students. The cost of a transcript is $3.15 per request for all graduates. Current students who would like an unofficial copy of their transcripts need to make that request through the Student Services office. 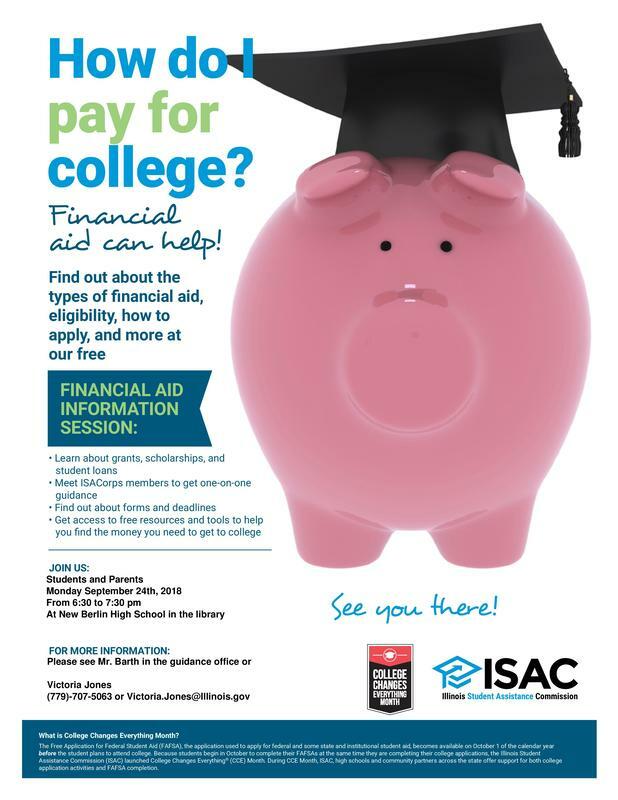 Representatives from the Illinois Student Assistance Commission will share information with students and parents about the financial aid process in college. 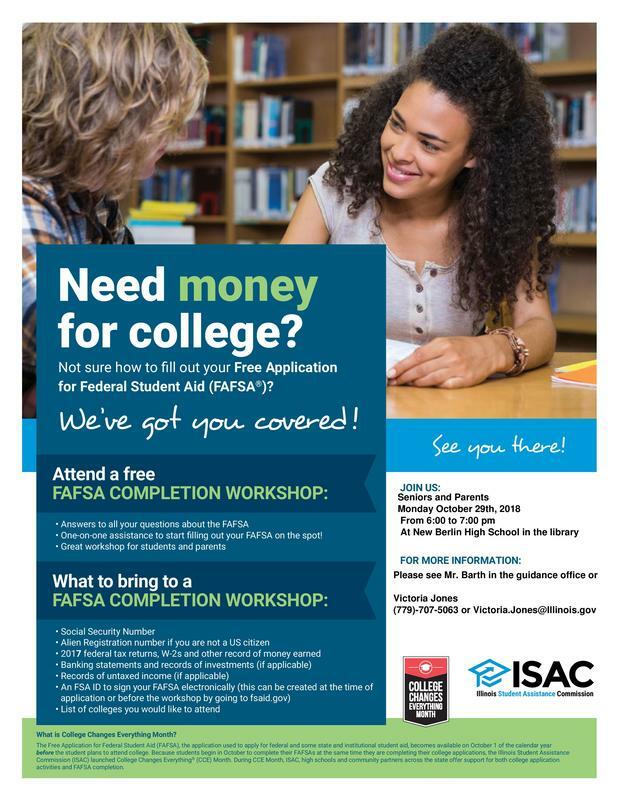 Representatives from the Illinois Student Assistance Commission will be here to assist students and parents with completion of the Free Application for Federal Student Aid (FAFSA). All seniors will have the opportunity to be excused from one period in order to complete a college application with the assistance of a representative from the Illinois Student Assistance Commission. Students will need to bring any pertinent information (such as Social Security #) with them that day. Mr. Barth will be available to provide assistance as well. Click on the publication above to view the full document. Are you interested in a career working with Case agricultural equipment? Parkland College in Champaign offers a Service Technician program that prepares students to maintain and repair equipment used in a Case New Holland or Case IH dealership. Students who complete the program will be granted an Associate in Applied Science degree. Students will receive specialized training in engine repair, hydraulic systems, powertrain, air conditioning, equipment function and setup, electrical and electronic systems, and test procedures and diagnostic tools. Are you interested in a career working with John Deere equipment? Lake Land College in Mattoon, Illinois and Deere and Company have a partnership with many unique and beneficial opportunities unavailable in other generic agricultural mechanic programs. The program has been producing high-performing technicians for John Deere dealers since 1993. Students can enjoy the low costs of community college education, and at the same time earn money as they train at dealerships during 20 of the 72 weeks in the program. Upon completion of training, graduating technicians receive an Associate in Applied Science degree from Lake Land. Nearly all of our graduates also receive a full-time job offer from their sponsoring dealerships. ASSE International Student Exchange Programs is pleased to provide your students an opportunity to study abroad in the 2017-18 school year. Participating in an exchange program gives your students more than just knowledge about another country and its language and culture. Time spent living abroad teaches them about building friendships, taking responsibility for themselves, respecting differences and tolerating the beliefs of others. Exchange students develop leadership skills, self-confidence and a greater understanding of the complexities of the world around them! This is why the best universities, as well as corporations and other professionals, look favorably on students who have spent a school year abroad. They know that former international exchange students bring a higher level of maturity and a global frame of reference to their university studies and activities. Academic year, semester, and summer programs are available. MyCreditsTransfer is a statewide initiative designed to facilitate transfer within Illinois using the nationally available tool, Transferology. Easily explore your transfer options using Transferology. 5. View schools' programs and/or request information. As a current high school sophomore, junior, or senior, you don't have to dream about attending a premier university. You can start now. University of Alabama Early College allows you to earn college credit while you are still in high school. Apply for UA Early College--the only one of its kind in the nation--and reach your goal from a nationally recognized top 50 research university. You may earn up to 30 hours of UA Early College credit, online and/or on the University of Alabama campus. UA Early College credit transfers broadly to most colleges and universities nationwide. The College Prep Scholarship program is designed to give high-achieving low-income 11th graders an advantage in college admissions. Recipients are juniors typically with an unweighted GPA of 3.5 or above in challenging courses, who come from a family earning less than $60,000 annually (for a typical family of four) with limited assets. The application deadline is in late March.